The Bellevue Downtown Association had a chance to sit down with Camilla Carper and Janelle Abbott, the genius behind AMPM (2.0) – an exhibit which opened at the Bellevue Arts Museum last week. We learned from them the inspiration behind their work, how their art has evolved, what it’s like to create an exhibition in Bellevue, and more! Read on to learn more about these creative geniuses! Carper and Abbott met while at Parsons School of Design in New York. 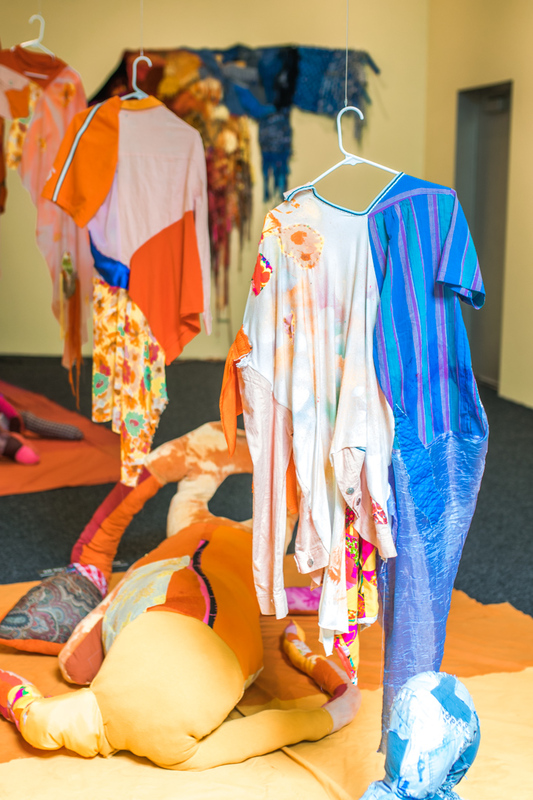 They started their project in 2012 as a way of continuing their friendship after graduation: the two artists work together by mailing garments back and forth between Seattle and Los Angeles. What it’s like working in Bellevue? The pair have worked in many West Coast DIY artist spaces, and did a runway show at the Seattle Art Museum, and have had the opportunity to connect with young creatives up and down the coast. However, this is Carper & Abbott’s first museum installation. 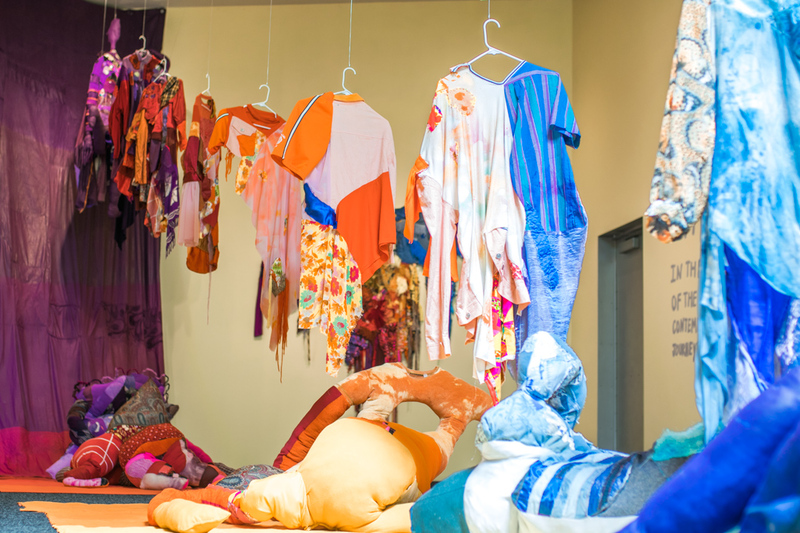 Working with the Bellevue Arts Museum connects them to “a whole new community within the art world that [they] haven’t had the chance to connect with yet." They’re excited to have a conversation with the art lovers of Bellevue and see how their interpretation of their work differs from the perspective of those they've connected with in the past and who know their work. When they need a break from putting their exhibition together, the two love going to Bellevue Square (Camilla loves malls, it’s Janelle’s childhood mall, and the two can’t get enough of the bottomless fries at Red Robin). We wondered whether or not there were any challenges to using snail mail to create art. While FEMAIL have perfected the art of “jamming clothing into priority mail boxes,” they acknowledged that certain elements such as sculptural chairs only see their final form when the two are together assembling the exhibition in Bellevue. Is “snail mail” still relevant? Meaningful materials: FEMAIL uses their own wardrobes as the raw components of the work. They also get clothing from family, friends, found along the roadside, thrifted and otherwise. From all this they choose to use things that have a connection to them personally. Transparency: FEMAIL lays out for the consumer exactly how and why they’ve priced each garment. They explain the various sources, the value to them, and even notate if they like the piece, if they don’t, if it was frustrating to create, if it’s been featured in press. FEMAIL wants people to know everything about the garment that they own because it will increase the personal value of the work to them. It allows the pair to express their story and connect in that way to their customers. Conscious: FEMAIL designs with a zero waste methodology - no waste is produced in conjunction with their work. Even the tiniest scraps get incorporated into the work somehow, at some point. 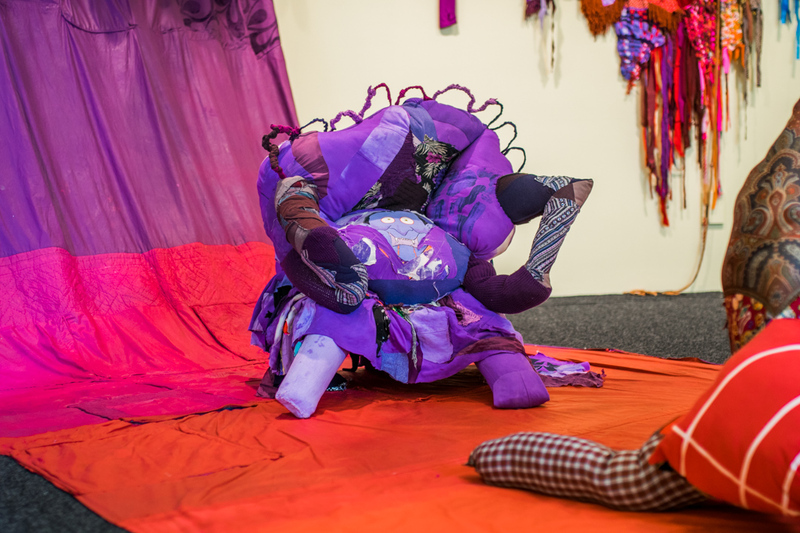 The pair only uses reclaimed or secondhand textiles and materials. Unlimited access: FEMAIL sets no boundaries on the borders of their clothing. They take whatever shape they will. FEMAIL doesn’t aim to produce garments at any set size. They don’t really believe in sizes, actually. Some pieces fit many bodies, some pieces fit very few. It’s up to the garment to decide what it will be and who it will fit. In the spirit of “unlimited access” the artists don’t consider gender to be a necessity to wear these pieces. With artwork that continually evolves, how did you decide to display what you did? Is your art ever really “complete”? For FEMAIL, the artwork is never truly complete. Everything is a constant work progress. When Janelle is done contributing to something, it’s Camilla’s turn to work on it, and visa versa. Camilla gets to decide if she wants to add on at that point or abstain and put the piece on pause. Janelle could come in and add into it again if she felt inclined. That’s why they have commas at the end of everything. They can each decide to add on or abstain from contributing at any time. Pieces are reworked and displayed over and over again. For them, it’s ultimately up to the customer to decide when something is finished (by purchasing the piece, otherwise, it’ll be stuck in limbo forever! ).